In rural Japan, especially in the Northern areas along the coast of the Sea of Japan, the winter is long and brings enormous amounts of snow. There was nothing much to do that sit back and wait it out. The farmhouses where difficult to heat and the family huddled around the hearth (irori) in the kitchen. It was a tough time to live through with great endurance. Animals like bears sleep through the whole cold season, also called fuyugomori. Adjective, kept in by snow: prevented from moving or leaving a place by heavy snow. Which can lead to feelings of depression called... cabin fever, winter blues, winter blahs, Seasonal Affective Disorder (SAD) . To keep the doors and windows shut and stay indoors. It could be done in any season, but in winter the home was kept closed to keep out the cold. The vendor of winter greens! 1688--winter. Bedstraw, also called goosegrass ('Galium spium'), was used to stuff mattresses for the poor. In winter, Basho has two reliable friends to keep him well, and both were green plants. Is Reichhold suggesting that Basho's futon is stuffed with bedstraw? And that Basho is using "bedstraw" as a figure of speech to mean himself? Ah, if only Basho had used 'fuyugomori' (winter seclusion) instead of 'sashikomoru' (staying indoors), it would make the translation somewhat easier, in my opinion. "Staying indoors" begs the question of who is staying indoors. Barnhill cleverly works around this by saying it's the creepers that are "secluded away." I think we are to take it to mean that Basho is identifying himself with the creepers. And I would use "peddler" rather than "vendor," since vendors can have stalls, and don't necessarily sell their wares going door-to-door. From the haiku of Basho we can see him at age 45, buy some greens and prepare his meager meal all by himself. The peddler was the only person he had seen and talked to in quite a while. His home, overgrown with mugura cleaver weeds, had just this one friend who came by once in a while. soot on my northern window. Especially in Northern Japan, where winter is long and brings much snow, the northern windows are coverd with strong wooden planks during winter time. With apricot blossoms in my heart. Matsuo Basho for his disciple Tsuboi Tokoku 坪井杜国, Nagoya. Tokoku had been put in exile for a crime he did not even commit. 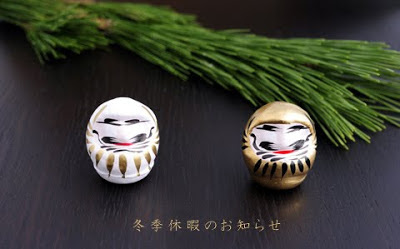 So if he would stay in hiding maybe next spring things will turn out better.
. - Tsuboi Tokoku 坪井杜国 - .
. byoobu ni wa yama o egaite fuyu-gomori .
. kinbyoo no matsu no furusa yo fuyugomori . There are 30 haiku by Issa on this subject. Shinji Ogawa notes that the phrase o-mukae no kane (Issa's variant: mukai no kane) means "welcome-bell" in the sense of welcoming the faithful to the next world, Amida Buddha's Pure Land. I first translated it, "the welcome bell," but Gabi Greve feels that this loses the sense of "someone waiting for his death." She suggests: "funeral bells/ starting to toll" or "coming to get me/ the bell is tolling." I have decided to go with "death bell," and to include the word "temple" (not in Issa's original text but certainly implied). is soon snowed in . . . 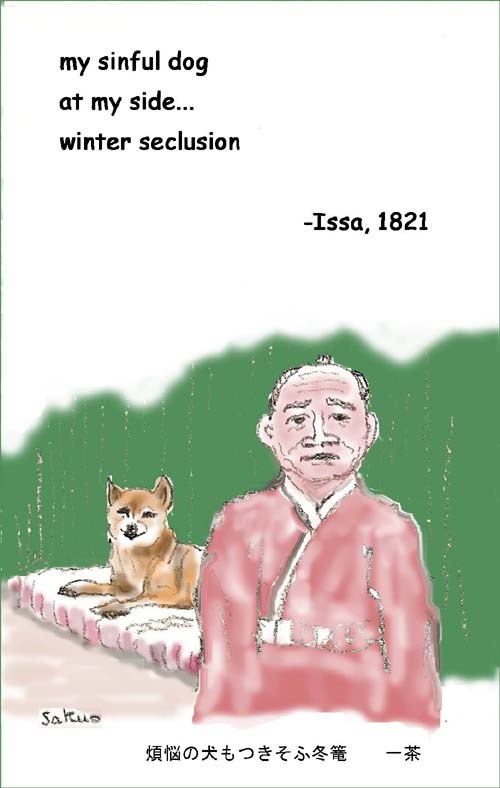 This humorous poem was written early in the 10th month (November) in 1813, when Issa was back in his hometown after getting his inheritance earlier in the year. Now the first snow has fallen, winter has come, and people in the village are saying goodbye to fall and its delicious fruit. The remaining fruit isn't very plentiful or delicious, but it's fresher than the dried or pickled fruit and vegetables the villagers will be eating from now on as they go indoors to survive the long, hard season of snow -- so go ahead, crows, take everything that's left. It's going to be a tough season for both humans and crows. 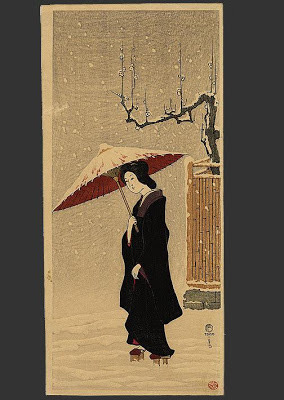 In waka and renga, "staying inside/going into seclusion in winter" was an elegant way of referring to plants in winter and occasionally to hibernation. In haikai, however, it also refers to humans, especially those who live in snowy or very cold areas. In the area in which Issa's hometown was located, it had a fairly specific meaning. People used bamboo, straw, and other materials to make roofed and walled entryways extending out from their doors to make sure they could get into and out of their houses during snowstorms. They also put bamboo or straw blinds over many windows in their houses, sheds, and barns that let in air but shut out most snow. Over bushes and plants they placed little straw tepees, and straw mats were wrapped around the trunks of trees. Since not much was going on, criticizing other people was a popular way of feeling good. "Winter confinement" or staying inside was often a rather dark, boring, and hemmed-in existence, so Issa seems to half-envy the crows in the first hokku. Issa's own notion of staying inside during winter was a very flexible and dynamic one that took some of its inspiration from the crows. On 10/12, a few days after he wrote the first haiku above, he was in the town of Naganuma to take part in a requiem service for the soul of Basho at the Basho Hermitage there, and on 10/19 he went to a hot springs spa in Yudanaka for three weeks to write and discuss haikai with the owner and his son. 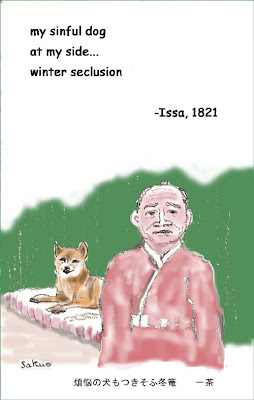 Issa's diary also shows that he often traveled through winter snow to other villages and towns to visit his students. Hitting the snowy road and staying at the houses of many different haikai poets was an effective way of avoiding the winter confinement blues. Woh ! There are many seclusion haiku indeed. I have grown up at warm seaside. I didn't see snow in my native town. It is hard for me to have real feeling of living in snow.